As the only west Ventura County licensed pediatric care and trauma center, Ventura County Medical Center has become the medical facility of choice for a new Ronald McDonald Family Room, a place where families can rest and regroup while caring for a hospitalized child. Amy Towner, CEO of Health Care Foundation for Ventura County, visited Rotary Ventura South on Monday, September 17, to provide members and guests with an overview of the ambitious plans. 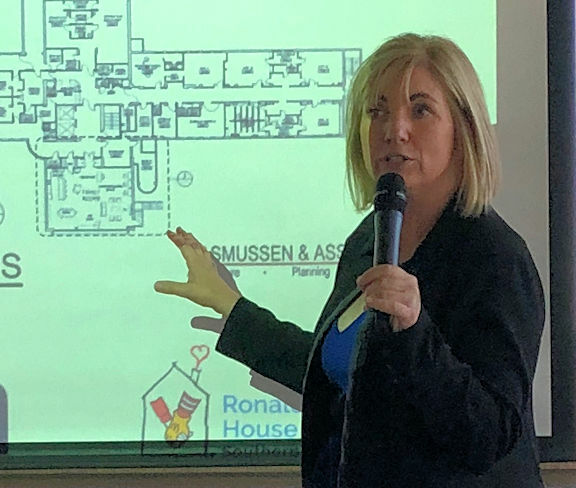 "The Ventura County Board of Supervisors has approved our moving forward with re-purposing an existing space at the Medical Center," said Amy, and she shared the preliminary architectural drawings of what was formerly the Homer Auditorium section of the building. "There will be places for families to have meals together, play, and have much needed quiet time," she explained. "It will be a home away from home during a very traumatic time in a family's life." Amy noted that the Foundation has already secured roughly $500,000 of the needed $750,000 to $1 million needed for the renovation. Plans are in the works for a County-wide walk-a-thon to help raise the remaining funds. "We have a goal of $100,000 for that event," said Amy. Rotary Ventura South President Melody Thurman noted that our Club and others in the area are making plans to participate in the event, tentatively scheduled for April.